The Wing Chair Chapter Closes! Sometimes I have no idea if anyone even reads this blog but I still feel compelled to update it, in case you were wondering what ever happened! Brace yourselves…Remember the WING CHAIR that was on the way…well, 3 MONTHS after purchasing it from Ballard Designs they cancelled the order. Guess the 5th delayed notification should have tipped me off? Shockingly appalled but we will no longer speak of it. I went on a search for nail heads, also called decorative nails, or upholstery nails, and the internet abounds with literally all shapes and sizes. I ended up with some from this site Create for Less. I went with a smooth headed nail and an antique brass color. They came 24 per box so I got about 5 to start. 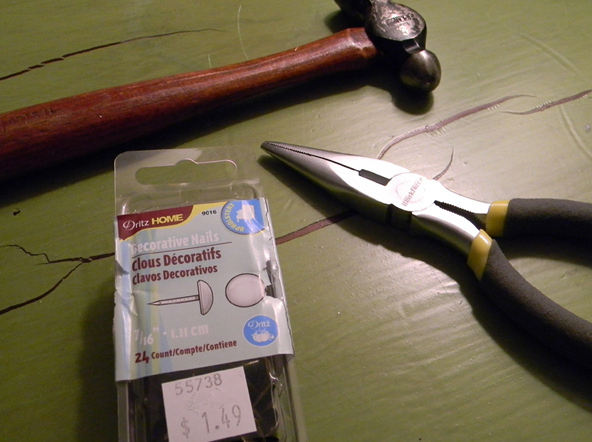 Also got my tools ready…the needle nose pliers would end up being key for mistakes. Next it was onto the SPACING. I choose individual tacks but apparently they come in attached strings as well. I wasn’t convinced that I wanted them touching, though. I suggest really looking at a lot of pictures to see what look you like. According to the people at the shop the chair might dictate where to put/how to space them but there are no rules per say. I gently pushed a few through the fabric to get an idea of spacing…Then I took a soft tape measure and low and behold I was eyeballing about 1inch apart. I lined them up with the tape measure for accuracy. MY TIP FOR YOU: At first I hammered in each nail all the way, then went to the next. Not a total disaster but I learned as I went it was better to 1) gently push all of them in along the entire chair, and then go back and hammer each in maybe halfway (you’ll feel it push through all the cushion and finally touch the wood inside) 2) After that, I would take off the tape measure and give it another eyeball ~ plucking out one or two that looked too low or too close was way easier if they weren’t fully hammered in. You want to be careful with the fabric, but they DO pull out well with the pliers. 3) Just hammer them all in fully. On those last couple of hits you’ll see the fabric get that squished look. Ah. Then you are all done! So the Wing Chair Chapter is closed!